This stone artifact was once part of a large wall inscribed with the story of the buried Ark and the Queen's son, Menelik. It is only a fragment and was subsequently used as part of another building. 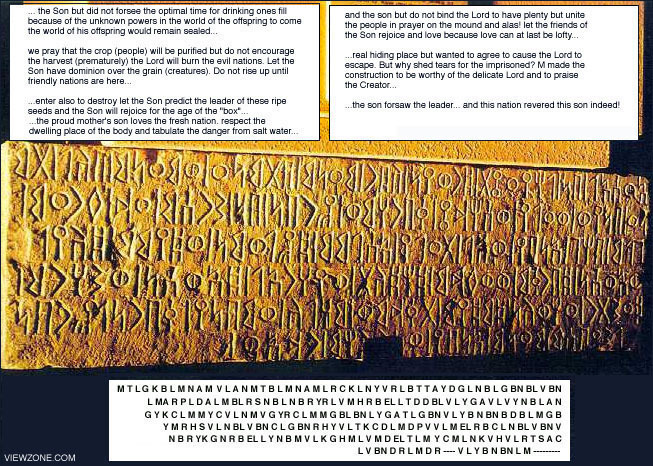 Other parts of this "prophecy wall" have been discovered but not yet translated. This stone is on display in the Yemen museum upside-down and has been rotated in this photograph to aid in translation. The translation above was made by using the original "first tongue" symbols and phonetic sounds. This method proved successful in many ancient texts from around 900 BC, but differs from the traditional set of symbols commonly attributed to Southern Arabic himyaritic scripts in many ways. As an experiment, we attempt the translation again using the phonetic sounds attributed to Southern Arabic but continuing to use the proto-Canaanite dictionary of "first tongue." To our surprise we see a similar story being told. Most significant is the vertical line, which in Southern Arabic script denotes a word break or space and has no sound value. In "first tongue" this is interpreted as a lamed, or L. Consequently, the "first tongue" gimmel symbol, resembling a crooked number seven, is considered the lamed in Southern Arabic. Other differences are with combined letters, such as the BN and BL which, in "first tongue" are translated as ligatures. In Southern Arabic the BN represents the sound value of "Z" or "Ts" while the BL represents a silent throat sound "s". The BN has been given the Tsadeh/Zayen sound and the BL continues to be silent in this experiment. The script, line by line, has been transposed to left to right for easier understanding. Following Southern Arabic phonetics, we have changed the lameds to word spaces, the [BN] to Z (zayen or tsadeh sound), the chet same as kaf, the gimmels to lameds, the [BL] to silent vowels). GM -- BD? -- ZNBY -- VZL -- TALY -- ZALMM -- CZLVMM -- VCYMM -- CKYL -- ?